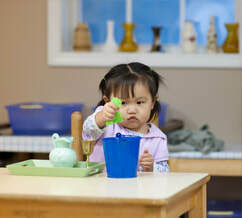 ​The Village Montessori School Toddler community is a unique environment, which facilitates appropriate development for this special age. Development is optimal in an environment of understanding, respect and support for the developmental tasks of the child. ​​The teachers’ knowledge of children’s needs and tendencies is crucial in preparing and implementing the toddler program. The first step is aiding the child in separation and the development of trust, as well as in becoming comfortable in a new environment. Your toddler will develop by leaps and bounds in our understanding, respectful, and supportive environment. Our Toddler Program centers on understanding and respect. Our mission is that this accomplishment is the starting point for the child’s secure exploration of the child’s new environment. The teacher remains an important catalyst for further social development by modeling and encouraging good manners, language and respect for others. The language curriculum consists of listening to stories and songs, singing, vocabulary enrichment and conversations. Learning words to express needs, desires and feelings is emphasized. These foundational lessons will help carry your child through primary, elementary, and middle school programs. The AMI Montessori toddler classroom offers many opportunities for large motor development. The materials in the classroom provide a variety of experiences for small motor development, eye-hand coordination, simple sorting and classifying, as well as sequencing and sensorial discrimination of shapes, sizes and colors. For those in need of extended hours, Lunch Bunch or All Day programs are available. Children in the All Day program will nap after lunch, they are in a peaceful environment with their teachers. 2 Day: Th, F 8:30 a.m. – 11:45 a.m.
3 Day: M, T, W 8:30 a.m. – 11:45 a.m.
3 Day: M, T, W (Through Lunch) 8:30 a.m. – 1:00 p.m.
3 Day: M, T, W (All Day) 8:30 a.m. – 3:00 p.m.
5 Day: M – F 8:30 a.m. – 11:45 a.m.
5 Day: M – F (Through Lunch) 8:30 a.m. – 1:00 p.m.
5 Day: M – F (All Day) 8:30 a.m. – 3:00 p.m.
​The beginning practical life exercises of simple self-help skills lead to independence and the development of competence, facilitating an “I can!” attitude. The toddler class daily schedule includes group time, independent work, outdoor play (weather permitting) and songs and stories. We also offer a summer program for toddlers with extra-curricular activities. Several parent resources are available to help make any decisions.